Debbie Miller Stonebraker has always loved animals, especially dogs. Her talent was apparent early in her life. Her kindergarten teacher told her mother that Debbie was going to be an artist. Her understanding of animals and her artistic ability combine to help her create some of the most realistic dog art out there. Her work has been described as hauntingly beautiful. 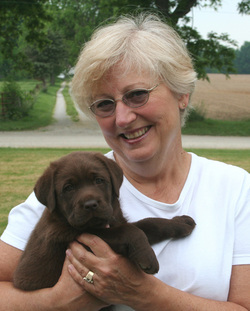 Deb was introduced to labrador Retrievers in 1971 when she purchased a black lab puppy for her boyfriend (now husband of 32 years). Since the first lab, Skeeter, there will always be at least one lab around the house. Deb and husband Craig, and son Cody are avid outdoorsmen. They live in Missouri near the Mississippi River where duck hunting and fishing are favorite sports. The Stonebrakers currently have three labs and a mixed breed rescue. Reba is 10, a fox red female who is also blind. Josie is a light yellow 6 year old female who has OCD in the hocks. Buddy is the rescue who showed up at their farm, and is of questionable origin. ;0) In 1999, they lost their 13 1/2 year old yellow female, Sunni, On Jan. 21, 2010, Debbie and son Cody released their old lab, Thunder, to the Rainbow Bridge. He would have been 15 years old on June 8. Recently, an adorable little chocolate gal named Darby has joined the Stonebraker family. Darby has big paws to fill, and hopefully she'll enjoy hunting, and be even somewhere close to the retriever that her siblings have been. Debbie's proudest achievement in her artistic career is that she was chosen to do the official portrait of Sirius, the yellow lab bomb sniffing police dog who perished in the attacks on the World Trade Center on Sept. 11, 2001. She and her son Cody, friend Chris Eck, and friends from Labsr4u were present in Liberty Park NJ for the presentation of the official portrait to Officer David Lim and the NYNJPAPD. The portrait now hangs in the Port Authority Police Headquarters building. Deb has participated in several national juried shows, including the "Hyatt" show in Minneapolis, and the Southeastern Wildlife Art Show in Charleston. She was named 1995 Illinois Ducks Unlimited Artist of the Year with her image entitled "Bright Promise". Several of her works were accepted into the Art Show at the Dog Show in Wichita in 2006, 2008, 2010, and 2011. Debbie's work has also been used several times on the National Labrador Retriever Club shirts, and many times on Ducks Unlimited shirts. Her portrait of Mac graces specialty license plates in Ohio. Much of her work is done in soft pastel and/or Prismacolor colored pencils on ultra-suede matboard. The medium lends itself to animal portraiture in that the softness of the fur and the depth of the eyes is conveyed. The best selling size is 9x12" and starts at $300. Larger sizes are available on a limited basis. Backgrounds are extra. US shipping is included. Debbie also offers watercolor portraits in a 9x12" format. They too start at $300 for one pet. Please take the time to enjoy looking at the portrait examples in the gallery to acquaint yourself with her work. If you have been considering having a portrait done of your special friend, maybe this is what you have been waiting for. All portraits are guaranteed to your satisfaction.